Pain is one of the hidden symptoms of multiple sclerosis. Many people do not realize it is a symptom present in up to 2/3rds of those diagnosed with MS. Thus finding tools to manage pain in multiple sclerosis is essential in managing your MS.
Nerve pain, known as neuropathic pain, is attributed to the disruption of central nervous system myelin. This type of pain can be continuous and steady, such as burning in the foot or tingling. Or it can be spontaneous and intermittent, such as spasms or trigeminal neuralgia. Musculoskeletal pain, known as nociceptive pain, is attributed to the effects of disability. This type of pain is caused by changes in gait, posture, muscle weakness, etc. Fortunately, it is possible to manage both types of pain of MS with hypnosis techniques. As you can see, hypnosis can be used to create anesthesia (not feeling the pain), to alter the sensation or move it to another area that is less painful, and to distract the attention of the mind to something more pleasant than focusing on the pain signal. In the presentation, Eva M Clark gives us an example of going to the dentist and choosing to imagine herself first at the beach as a way to distract her attention from the pain and then altering the sensation of pain to resemble getting her hair washed at the hairdressers. Both techniques are good examples of using self-hypnosis to relieve pain. An important hypnotherapy technique that can be used to manage multiple sclerosis, not in the first sessions but once the client has become accustomed to using hypnosis, is “exploring the cause and meaning of multiple sclerosis.” Why is this important? Because only focusing on reducing symptoms such as foot pain will not heal the disease. And if those symptoms are there for a purpose and the symptom is removed without working through its cause, that symptom will return, or another one might take its place. Nothing is happening in the body that does not have a cause. Hypnotherapy can help discover that cause. If, however, the brain receives, at the same time, other energy impulses or stimulus, the pain in the toe is drowned out or dulled. That is one of the techniques used in hypnosis. 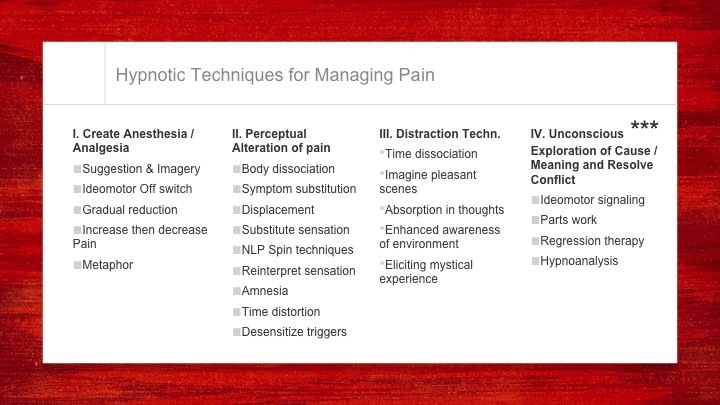 It invites you to practice focusing on other more pleasant stimuli to dull or drown out the signal of pain. A Baclofen pump uses a similar technique to distract the brain. It also sends energy impulses into the spinal cord to interrupt and distort the signals of pain. So, in the example of MS foot pain, when the nerves in the foot send a signal of pain, that signal travels up the spinal cord and joins the signal being sent up by the Baclofen pump. 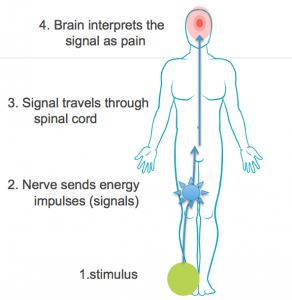 The brain then receives a distorted signal and doesn’t translate it as pain. Baclofen pumps, just as hypnosis, focuses on altering the signal. Hypnosis helps to relieve pain by teaching the client how to alter, distorting and distract the pain signals. You can read more on hypnosis for MS pain in our next presentation here. Learn more about this alternative treatment of MS and subscribed to our newsletter to receive these lectures each month! This is a wordpress site from Studio Press. The template isn’t that expensive and it looks more professional than the free ones. Then its just filling it up. I had someone who know wordpress fill out some of it from a previous site I had and then I reviewed with her what she had done so I could replicate. Once you’ve written a few ‘posts’ and ‘pages’, you get a-hang of it quite quickly. Good luck!!! It’s been a few years since I last saw you. I’ve moved to Eugene Oregon. The MS has really progressed and I can barely walk. The spasms are SO bad. I am NEVER without a heaviness and tiredness in my legs. I’m trying to use your techniques but I have a hard time blocking the pain and stiffness out. Any ideas? I really could use your help. Thank you for the MS series. They are very helpful. Hello Julie, Sorry I didn’t see your comment until now. Still learning about WordPress! The last month’s and this month’s meeting are on pain. I hope they can give you some ideas. If not, if you’d like to have a free consultation, I could address your syptoms directly.